While the first generation of Famine Irish were typically relegated to economic positions as manual laborers and domestics and frequently had little or no education to assist them in “bettering” themselves, second and particularly third-generation Irish-Americans in Middleborough availed themselves of the opportunity of free public education, and through the acquisition of new skills obtained better-paying employment which also held out the possibility of upward mobility. Through these changes, local Irish-Americans in the late 19th and early 20th centuries began to become assimilated and attain positions in fields previously closed to them including business, law, and insurance. 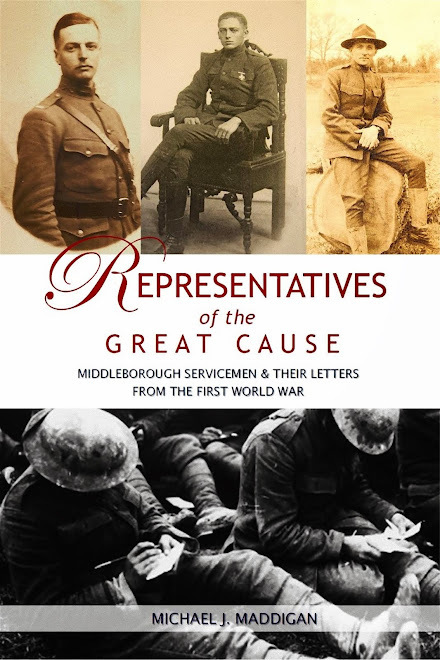 Additionally, the Irish-American community entered into local politics, most notably through the Middleborough School Committee which proved a vehicle to further success and prominence within the larger community. All of these developments helped local Irish-Americans move away from the mid-19th century’s characterization of them as “paddies”. Among the earliest of Middleborough’s Famine Irish to achieve a level of economic success beyond laboring was Timothy F. Creedon (c. 1851-1923) who was able to parlay skills brought with him from Ireland into a successful career as a businessman and florist. The details of Creedon’s early life in Ireland, like those of many first generation Irish are conflicting and clouded. Born in County Cork, Ireland, about 1851, Creedon emigrated as a young boy, coming to America in 1856 and becoming naturalized two years later in 1858. Other sources indicate that Creedon emigrated at about the age of 14, having first worked with his father, a gardener and florist, on a large estate in Cork where he acquired his knowledge of plants, flowers and gardening. Creedon worked in Connecticut and New York before being engaged on the estate of Judge David Allen Smalley (1809-77) at Burlington, Vermont. Probably following Smalley’s death, Creedon came to Middleborough to enter the employ of Levi P. Thatcher who hired him to tend his own gardens and greenhouses. Thatcher’s greenhouses had been erected about 1870 in the rear of Thatcher’s home facing Thatcher’s Row, and for 27 years Creedon would have charge of them. Creedon purchased the Thatcher greenhouses in 1905 and relocated them to his home on Wareham Street at the corner of Benton Street where he established a floral business. T. F. Creedon, the veteran florist so long in charge of the greenhouses on Thatcher’s row, has started the erection of a new greenhouse plant at his home on Wareham street. The plant comprises three houses, which are large and roomy and well adapted for his purposes. As for most early Irish Catholics, the local Catholic parish provided Creedon with a strong sense of community and identity. 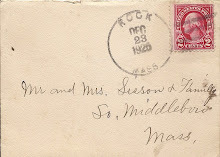 Creedon’s connection with the local church was further strengthened by his marriage to Ellen Sullivan, the daughter of Patrick and Ellen (McCarthy) Sullivan in whose home on Wareham Street the first masses in Middleborough were held. At the time of his death, Creedon was one of the oldest members of Sacred Heart parish, and he had attended mass in Peirce Hall, the space above the Peirce store on North Main Street before the construction of a Catholic church in town. Creedon was also a member of the committee which acquired the site for St. Mary’s Cemetery, thereby providing a burial ground for Middleborough Catholics. Additionally, Creedon was an active member of local Irish and Catholic cultural organizations including the Ancient Order of Hibernians, Massachusetts Catholic Order of Foresters and the Knights of Columbus. Creedon’s floral business became one of the most successful businesses in Middleborough. Following Creedon’s death, the business was operated as “Creedon, Florist” by Creedon’s son James Henry Creedon (1888-1955). The younger Creedon’s experience, like that of many second and third generation Irish in Middleborough, demonstrated the powerful influence of public education. While most Irish immigrants recognized the value of educating their children, not all did. In April, 1902, James Houlihan was before Judge Allan in the District Court for keeping his son, Joseph, from school. “He agreed that the little fellow should go to school the rest of the term regularly, and his case was placed on file to see how well his promises will be fulfilled.” Yet whether public education was regarded as desirable or mandatory for their children by local Irish-American parents, it was a crucial factor in the improvement of their lives and their economic prospects. James H. Creedon clearly fell into the camp which saw a public school education as indispensable. Availing himself of the opportunity of a free public education, the younger Creedon attended Middleborough public schools, graduating from Middleborough High School in 1900, and early in his career worked as a successful journalist for local newspapers throughout the region including the Boston Post, Brockton Times, Brockton Enterprise, New Bedford Evening Standard and Middleboro Gazette. Creedon was active in local Democratic party circles and in 1914 at a time when the position of local postmaster was a plum politically-determined appointment, Creedon (who passed the postal service examination in 1903) was named Middleborough Postmaster, a post he held until 1922. Creedon also served as a member of the local Public Safety Committee during the First World War, but limited his involvement in municipal affairs after that. In 1926, he declined appointment as an Overseer of the Poor in Middleborough. Though the floral business was sold by the Creedon in 1938, for many years following it retained the “Creedon” name, an indication of the success which its immigrant founder was able to build within the community. setts the son of Thomas (c. 1830-1902) and Ann (Kerrigan) Boucher. The elder Boucher immigrated to America at the time of the Famine. Hampered by an inability to either read or write, he found employment as a common laborer throughout his adult life, at times working as an agricultural laborer. He appears never to have become a naturalized citizen. Despite these disadvantages, Boucher was able to establish a comfortable life for himself and his family. Home ownership would become an important indicator of economic stability and success for Irish immigrants during the post-bellum period when many would acquire or build homes for themselves. In 1870, Boucher constructed a house on Center Street in the front of Sylvanus H. Vaughan’s livery stable, and five years later built a new house on High Street. For a century the Boucher family would be associated with this area of Middleborough near Everett Square. Perhaps because of his lack of education, Boucher ensured that at least his sons, William, Thomas F., James and John E. attended school. [There appears no record that daughters Mary E. (1862-1939) or Katherine (1864-1934) ever did]. The eldest son, William Boucher (b. 1860), like many second generation Irish-American men followed in his father’s footsteps and worked as a laborer (1880), though he was skilled enough by 1884 to list his occupation as that of carpenter, while daughters Mary and Katherine found employment in the local shoe industry. For various social reasons, many Irish married late or never at all, and in fact neither of Boucher’s daughters ever married. ugh, the Bouchers maintained close ties with and were active in both the Sacred Heart church as well as Irish Catholic fraternal and social organizations locally. For a time, the second floor space over Boucher’s shop known as Boucher’s Hall, was utilized by Catholic organizations in town such as the Ancient Order of Hibernians and the Middleboro Catholic Club. During St. Patrick’s evening celebrations at the turn of the last century, whist was occasionally featured as an attraction and its popularity may have contributed to Boucher’s decision to use his hall as a “whist parlor” in 1905. Second-generation Irish-Americans typically married “one of their own”, and in 1900, Boucher married Julia K. Mansfield (1864-1946), who like her husband had been born in Massachusetts of Irish immigrant parents. Their son, Thomas F. Boucher, Jr. (1906-2000) was also able to obtain an extensive education which would have been unheard of a generation before. After attending Middleborough public schools, he graduated from the New York School of Forestry in 1926 before entering his father’s business in 1927. John (1833-73) and Margaret (Hogan) Sullivan (1833-1912) were one of the several Sullivan families who came to Middleborough in the wake of the Famine. Both came from County Cork and they settled at Taunton, but came to Middleborough sometime in the late 1860s where Sullivan found employment with the Old Colony Railroad and where they settled on Vine Street. Sullivan died in 1873 of pneumonia, leaving his widow, two sons Dennis D. and John J., and two daughters Honora (“Nora”) and Mary. Despite this advantage, in early life Dennis D. Sullivan (1863-1941) led what was a typically Irish-American life in Middleborough. At 16 he went to work as a laborer, but in contrast to many boys at the time, he continued his studies. Education would prove the vehicle which would permit Sullivan to escape the pattern of a previous generation which had seen most Irish confined to manual jobs. Sometime after the completion of his studies, Sullivan in the late 1880s established a meat and provisions business from his home on Center Street (now 167 Center Avenue) delivering groceries and meat to local neighborhood homes through the early 1890s. It is likely that the operation was used to fund Sullivan’s higher education and help fulfill his ambition to enter the professions. 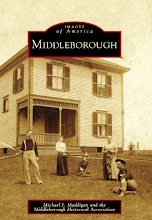 By at least 1895 if not earlier, Sullivan was able to establish a real estate and insurance business which was so successful that he was able to purchase the Middleboro Insurance Agency in 1905. While engaged in this field, he attended and graduated from Boston University Law School, being admitted to the Massachusetts bar in 1898. Sullivan must have demonstrated remarkable legal ability for just two years later he was appointed as an associate justice of the Fourth District Court of Plymouth County. “Early in his years of practice, Judge Sullivan distinguished himself as a trial lawyer”, and he would enjoy an illustrious judicial career, serving for over 35 years. Sullivan would serve in a number of civic and municipal roles, and was a strong promoter of business and residential development locally, serving as president of the Middleboro Land Improvement Company in the late 1890s, largely due to his local expertise in the real estate field. Sullivan’s children would demonstrate the continuing success of third generation Irish-Americans. Daughter Irene L. Sullivan became one of the first college-educated Irish-American women in Middleborough, attending Trinity College in Washington and training as a kindergarten teacher at Boston, before entering the educational field. Eventually she was named principal of the Forest Street (Flora Clark) School before marrying Theodore Stegmaier in 1920. John V. Sullivan was educated in Middleborough Public Schools, graduating from Middleborough High School in 1907 alongside his sister, Irene. Like his father, Sullivan attended Boston University Law School, graduating in 1910 with an LL. B. Admitted to the Massachusetts bar in 1911, Sullivan joined his father’s practice which was subsequently known as Sullivan & Sullivan with offices in what is now the Glidden Building on Center Street, though then known as the Sullivan Building. In 1922, Sullivan was named Assistant U. S. District Attorney for Massachusetts and between 1925 and 1933 he served in various capacities in the combined district attorney’s office in Plymouth and Norfolk County. In 1931, he was promoted to First Assistant District Attorney, a position he later resigned in order to resume his private practice. In 1938, Sullivan succeeded his father as associate justice of the Fourth District Court. Additionally, he served as Middleborough and Carver Town Counsel, and was a member of the Middleborough School Committee from 1914 through 1922. While Dennis Sullivan had a strong entrepreneurial sensibility, it was his brother John J. Sullivan (1870-1953) who became a noted businessman in Middleborough, for years operating a newsstand near the Four Corners. Like his brother, John Sullivan attended the Eaton Family School, but he left there at the age of 15 in order to take a job in the Bay State Straw Works on Courtland Street for the sum of $3.90 a week. Along with his sister Nora, he was afterwards employed in the Hathaway, Soule & Harrington shoe manufactory on Cambridge Street. Later, he was employed at Begley’s meat market and Beckman’s provision store and it is in this latter establishment that he learned the newsdealer trade. Beginning in 1907, Sullivan sold Sunday newspapers, having purchased the right to do so from druggist John Shaw. In August, 1908, Sullivan opened his own place of business on Center Street near the Savings Bank Building. The business, known as Sullivan’s News Stand was described by Middleborough historian Mertie E. Romaine as “probably the smallest business establishment in Middleboro … just a chink in the wall at 30 Centre Street, approximately six feet wide and thirty feet deep.” Nonetheless, the business proved profitable enough for Sullivan to purchase the former home of John C. Sullivan on Pearl Street where he resided for the remainder of his life with his sisters. At the time of his death, Sullivan left an estate of $100,000, a considerable sum at the time. Like the Sullivan family, the Callans would find successful professional lives in the legal and judicial profession despite the humble origin of their immigrant ancestor, Luke Callan. Luke Callan was born the son of Philip and Rose (Boylan) Callan in County Cavan sometime in the 1830s, and emigrated to America in 1854, first coming to Woonsocket, Rhode Island. Later he relocated to East Taunton, Massachusetts, and became engaged in the shovel industry there. “He rapidly learned all portions of this trade and became remarkably proficient, so much so that when the company operating the shovel shop in Middleboro, located at the Wareham street dam, in looking about for a skilled workman secured Mr. Callan and paid him a big salary for those days.” Callan produced the shovels exhibited by Brown & Sherman of Middleborough at the Philadelphia Exposition in 1876, a display which was awarded first prize. Following the destruction of the Wareham Street shovel works by fire, Callan was employed by the Star Mill and later by Hathaway, Soule & Harrington, shoe manufacturers. In these positions, Callan was required to read, though it is recorded that he could not write. Likely through these wages and savings earned over time, Callan was able to purchase a house lot from Philander Washburn for $350 on the newly-built Clifford Street in March, 1872, upon which he constructed a house (which no longer stands). Like the Creedons and Bouchers, Callan was actively involved with the Sacred Heart church, serving as a sexton for a considerable length of time. Callan’s children were among the early Irish-American second generation attending Middleborough public schools, and obtaining better positions in the local shoe and woolen industries. Philip Callan (1858-1916) worked in the Star Mill before relocating to Providence and his brother, John L. Callan (b. 1862) also worked there for a time. Martina Callan (1869-1931) was engaged in the shoe industry, working as a shoe steamer, while her sister Rosetta [“Rose”] Callan (b. 1871) worked as a dress maker. Youngest son Luke F. Callan (b. 1872) also worked in the local shoe factories as a laster. By 1910, he had risen to the position of foreman and he was able to purchase the Charles Peirce house on Clifford Street at that time, thereby remaining close to his family. Callan’s son, Luke F. Callan, Jr., who was better known as L. Francis Callan (1901-62), was educated in Middleborough public schools and Dartmouth College, graduating in 1923. He subsequently attended Boston University Law School as had Dennis and John V. Sullivan before him. 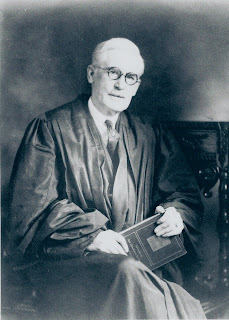 Following his graduation in 1927 and admission to the Massachusetts bar, Callan was assisted in his early legal career by Dennis D. Sullivan, by whom he was employed, and Callan’s career would remain connected to that of the Sullivans. In May, 1944, when John V. Sullivan was elevated to the Superior Court, Callan succeeded him as presiding justice of the Fourth District Court. Also like both Sullivans, Callan became associated with local business circles and served as a director of and counsel for the Middleborough Co-operative Bank. Additionally, like John V. Sullivan before him, Callan served as a member of the Middleborough School Committee between 1935 and 1946. His son and granddaughter would continue the family's association with the legal profession. It is not clear when the Maddigan family emigrated from County Kilkenny, Ireland, though it appears to have been about 1854-55. 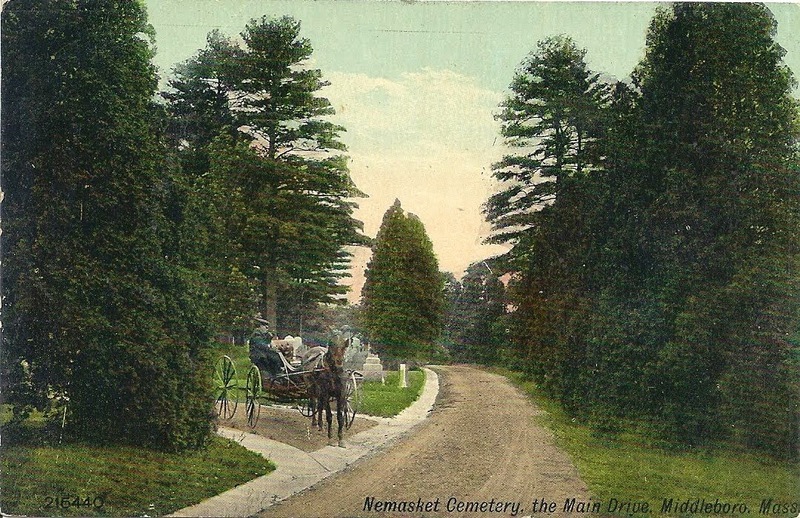 Arriving by way of Rhode Island, the extended family of Michael (c. 1797-1863) and Mary (Welch) Maddigan, their son Thomas (1828-1900) and his family, and probably Michael’s nephew John Welch and either Welch’s wife or sister Mary were settled at Tremont in Wareham in 1855. There the Maddigans found jobs as laborers their experience was typical of that of other Irish-Americans. Like many men of the period, Michael Maddigan’s sons, Michael and James both served as Union soldiers during the Civil War. James (c. 1824-64), served in the 58th Regiment, Massachusetts Volunteer Militia, and died of wounds incurred during service in 1864. Thomas Maddigan’s son Michael J. Maddigan (1855-1931) like other second generation Irish-Americans, attended school early on, though later left to take a job to help support the family. By 1870, he was working with his father in the Tremont Iron Works and was occupied as a nailor and later a heater. By the age of 20 he had reached the rank of foreman in the “mill which smelted iron and rolled it for the Tremont Nail Company”. 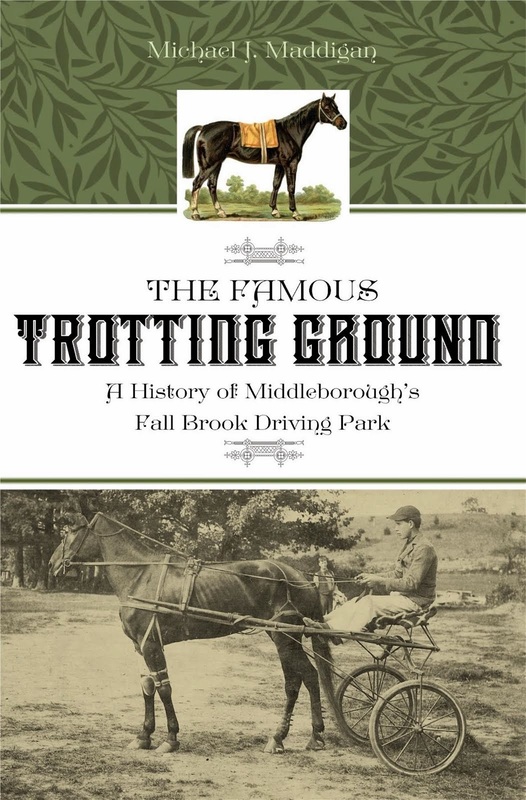 The family removed to Middleborough sometime between 1886 and 1889, at which time Maddigan entered the dairy business on Rocky Meadow Street, a pursuit which would later be followed by his son, James F. (“Frank”) Maddigan . About 1889, the family moved to Middleborough center, ultimately purchasing a home at 10 Star Avenue. It was about this time that Maddigan took a position in the Four Corners grocery store of Ira Tinkham before being hired out to Everett Lincoln. 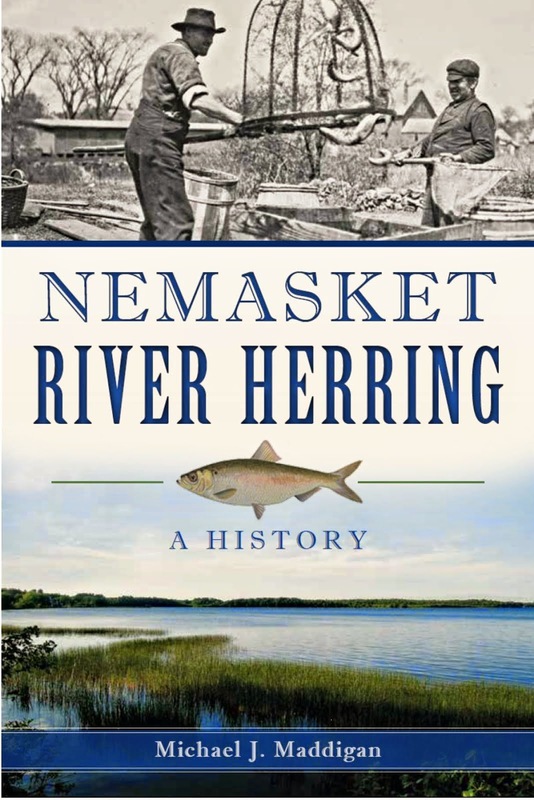 Maddigan later was employed as a day laborer and fireman and nightwatchman in the Nemasket Worsted Mill. Unlike other early Irish-American immigrants, Maddigan married a New England Protestant, Mary E. (Dunham) Maddigan, and through her influence some members of the family became associated with the Episcopal Church of Our Saviour, including the couple's son Ralph William Maddigan (1890-1973). Others, like Maddigan’s eldest surviving son Frank would adhere closely to the Catholic Irish-American pattern, remaining a lifelong communicant of Sacred Heart church and marrying Catherine M. Gibbons who had emigrated from County Roscommon to Providence where she worked as a domestic before coming to Middleborough. Though a number of the Maddigan children would take employment in the nearby Nemasket woolen mill, Ralph W. Maddigan took a different course and would achieve the highest level of professional success. At the age of 12, Maddigan went to work for his older brother Frank who operated a dairy. “He milked cows, and, pulling a small cart, peddled milk in the neighborhood, measuring out the milk (at 5c a quart) into cans which customers brought to their door.” Maddigan attended high school for two years before leaving for employment in a shoe shop. At the time, educational opportunities still remained a luxury for many Irish-American families who needed the children to work in order to support the family. Nonetheless, like Dennis Sullivan before him, Maddigan continued his studies at night school, studying bookkeeping and mathematics. Maddigan later said that “nearly as soon as I was 21, I left the shoe shop, because I didn’t feel that there were as great opportunities there as somewhere else.” Through an acquaintance, Maddigan became interested in insurance and took a job with the Prudential Insurance Company, having responsibility for a premium collection route in Middleborough and East Taunton. This, in turn, led him to sell insurance on a commission basis. Like the Sullivans and Callans, Maddigan began the study of law and, upon the advice of George Fox Tucker, a lawyer residing in Lakeville, Maddigan entered the law office of Bert J. Allan. Maddigan offered to his services without pay if Allan would help him learn law. Allan, himself, had learned in a similar fashion in the office of John C. Sullivan. Through training in Allan’s office, Maddigan learned real estate, as well, while continuing to sell insurance. 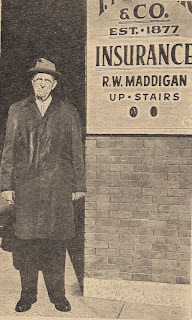 Though the firm, now owned by the third generation, has been associated with the Maddigan family for nearly a century, it has always retained the Ryder name, a consequence of anti-Irish prejudice which lingered as late as the 1920s. The reason the Maddigan name was not given, lies in the shadow of one of society’s great faults: racial prejudice. In these parts, 50 years or so ago, to be Irish, and Catholic as well, was to be a member of an unpopular minority. 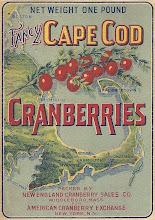 This was particularly true of Cape Cod at that time, where the original T. M. Ryder Company had a major part of its patronage. [Ralph Maddigan], whose ancestors on his mother’s side were Yankee ships chandlers and New Bedford whalers, but whose father was of direct Irish descent, recognized the fact that in the Cape area the Ryder name had Anglo-Saxon Protestant status and acceptance. Like the Sullivans and Callan before him, Ralph Maddigan sought a place on the Middleborough School Committee. Though ultimately unsuccessful in his bid, his son, Ralph Maddigan, Jr., would serve as a Middleborough selectman from 1946 through 1955, being probably the first local Irish-American to serve in that post. By that time, however, ethnicity and religion (at least in regards to the Irish) was no longer an impediment to social or economic advancement and success within the community, thanks in large part to the second and third generations of Irish-Americans who paved a way towards a better future for their families and their descendants. T. F. Boucher, advertisement, Resident and Business Directory of Middleboro and Lakeville, Massachusetts: 1909 (Boston, MA: Boston Suburban Book Co., 1909), page 62. 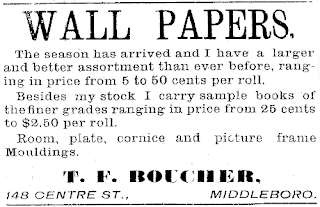 "Wall Papers", advertisement, Middleboro Gazette, March 9, 1906, page 4. Sullivan Family Outside 49 Vine Street, Middleborough, MA, photograph, 1880s. Courtesy of Chris Sullivan. 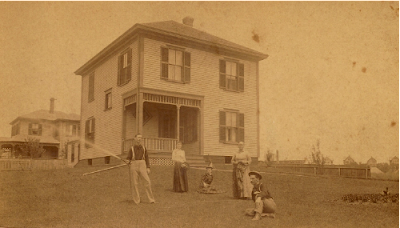 This photograph depicts the Sullivan family outside their home which was purchased in May, 1870 from William Jeffers. It was here that Dennis D. Sullivan, seen holding the bridle of the horse, first established a meat and provisions business as indicated by the "MARKET" sign on the barn. His brother John stands next to their mother, Margaret (Hogan) Sullivan, while sisters Mary and Nora are also present. Judge Dennis D. Sullivan, photograph, mid-1930s. Courtesy of Chris Sullivan. 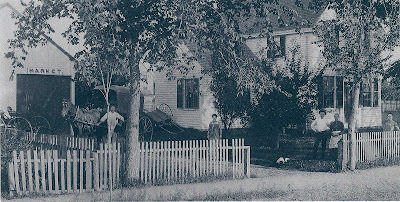 Sullivan Family Outside 791 Center Street, Middleborough, MA, photograph, early 20th century. In 1890, Margaret Sullivan purchased this house on the corner of Center and Lovell Streets which she occupied with her family. The house, only recently built at that time, was a step above the Vine Street house which was both older and smaller, and the purchase demonstrates the upward mobility which local Irish-Americans began to experience at this time. Nonetheless, the Vine Street house held sentimental value for Mrs. Sullivan and it was not sold until 1913, a year following her death. John Sullivan waters the lawn, while his brother Dennis sits. Margaret Sullivan is again at the center of the picture with her daughters Mary and Nora. This is the photograph which appears on the cover of Images of America: Middleborough. 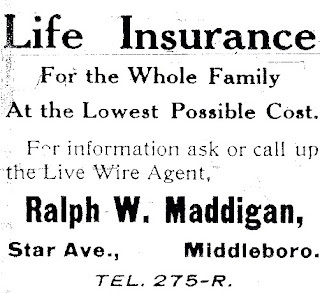 "Life Insurance", advertisement, Middleboro Gazette, July 19, 1912, page 8. Ralph W. Maddigan was just 22 when he placed this ad in the local newspaper. He initially sold insurance from the family's Star Avenue home. Ralph W. Maddigan, photograph by Clint Clark, newspaper half-tone, January, 1971. "Insurance Notice", notice, Middleboro Gazette, December 28, 1917, page 8. In part due to lingering prejudice against Irish Catholics, Ralph W. Maddigan chose to retain the Ryder name when he purchased T. M. Ryder & Son. 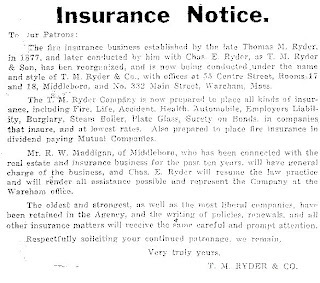 While the firm became known as T. M. Ryder & Co., and the notice mentions Maddigan's involvement with the firm, it continues to stress the firm's origins and Ryder connections. Ironically, Maddigan was an Episcopalian. History and Directory of Middleboro, Mass., for 1889. Needham, MA: A. E. Foss, 1889. History and Directory of Middleboro, Mass., 1892. Needham, MA: A. E. Foss & Co., 1892. Lainhart, Ann S. 1855 and 1865 Massachusetts State Census for Middleborough. Boston, MA: n. pub., 1988. The Plymouth and Bristol Counties Register for 1899-1900. Boston, MA: Union Publishing Company, 1899, p. 101. Resident and Business Directory of Middleboro and Lakeville, Mass. 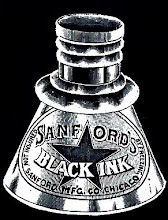 For 1895. Needham, MA: A. E. Foss & Co., 1895. 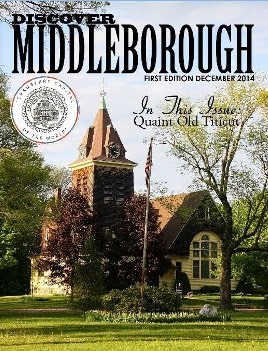 Resident and Business Directory of Middleboro, Massachusetts. For 1897. Needham, MA: A. E. Foss & Co., 1897. Chris Sullivan, Sullivan family photographs and information. Seventh Census of the United States, 1850. National Archives Microfilm Publication M432. Washington, D.C.: National Archives and Record Administration, n. d.
Eighth Census of the United States, 1860. NARA microfilm publication M653. Washington, D.C.: National Archives and Records Administration, n.d.
Ninth Census of the United States, 1870. NARA microfilm publication M593. Washington, D.C.: National Archives and Records Administration, n.d.
Tenth Census of the United States, 1880. Washington, D.C.: National Archives and Records Administration, 1880. United States of America, Bureau of the Census. Twelfth Census of the United States, 1900. T623. Washington, D.C.: National Archives and Records Administration, 1900. United States of America, Bureau of the Census. Thirteenth Census of the United States, 1910. T624. Washington, D.C.: National Archives and Records Administration, 1910. I came across your page when searching on "Stegmaier" which is a family name related by marriage. Thank for for shedding some insight into their lives!